Whose team is the doctor on? 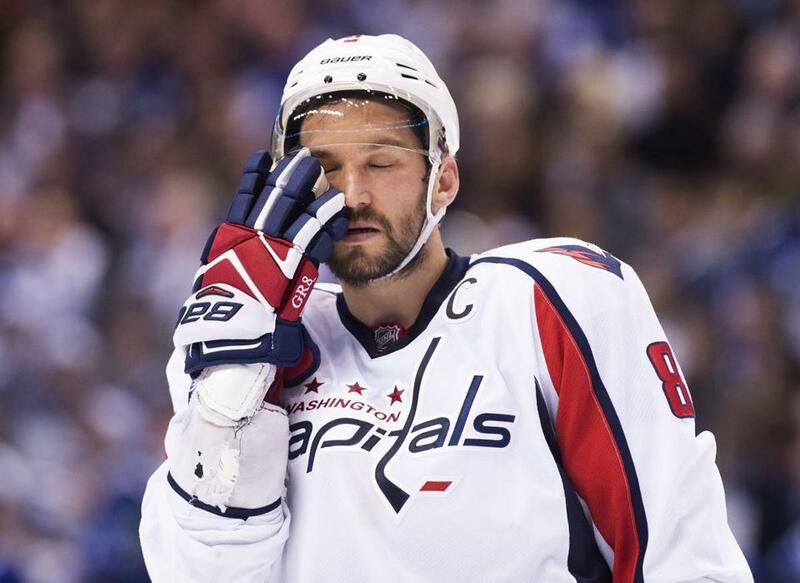 Washington Capitals captain Alex Ovechkin during a first-round playoff series game in April. During the NHL playoffs this spring, Sidney Crosby of the Pittsburgh Penguins returned to the rink after what appeared to be a severe concussion. In that same series, Alex Ovechkin of the Washington Capitals used injection painkillers to stay on the ice despite an ugly knee-and-hamstring injury — an injury serious enough to keep him off his native Russia’s national team in the World Hockey Championship in May. Meanwhile in basketball, Boston Celtics forward Jae Crowder kept on playing this spring despite a mysterious elbow injury that produced a tingling sensation. A month later, there were suggestions that his teammate Isaiah Thomas was playing through a broken jaw — suggestions that the team strongly disputed. And then there’s football. Late last month, a landmark study by researchers at Boston University and the VA Boston Healthcare System found evidence of chronic traumatic encephalopathy — a degenerative disease connected with repeated blows to the head — in 110 out of the 111 donated brains that researchers examined from former National Football League athletes. The findings raise fundamental concerns about players’ safety. Who’s to say when a professional athlete is too injured to stay in a game? More to the point, who can be trusted to make that decision? Especially as public attention turns from the sudden bone fractures and muscle pulls that have long bedeviled pro athletes to chronic brain injuries, the role of team doctors is drawing new scrutiny. According to guidelines from the American College of Sports Medicine , these professionals must have either a medical doctor or doctor of osteopathy degree and take a leadership role with the team through the medical care they provide for athletes. They are required to have specialized training in musculoskeletal injuries and other common conditions afflicting athletes. In addition to assessing and treating injuries that occur during games, team doctors also make the final decisions about whether an athlete is medically able to play for a team in the first place, or to return after an injury. Even when fans rationally grasp the risk to individual competitors, we can’t help but feel that hard hits enrich the spectacle. At times, though, keeping an injured player on the field may further a team’s interest in winning, even at a player’s long-term expense. Earlier this year, The Washington Post found evidence that NFL team doctors had violated federal laws and safety guidelines around prescribing painkillers; in 2012 alone, doctors for the average NFL team prescribed 5,777 doses of nonsteroidal anti-inflammatory drugs and 2,213 controlled medications to players. The NFL Players Association has subsequently filed a lawsuit against the league. Because team physicians are hired, fired, and paid by individual teams, some experts argue that potential conflicts of interest may be unavoidable, that the standard of care offered to even elite athletes may be compromised, and that the time has come to restructure doctors’ role. Team doctors represent only a tiny percentage of the physicians in the United States, but how they handle the potential conflict goes to the core of the medical profession itself. The health care system defers to the judgment of doctors, who receive years of training. These professionals cannot do their jobs without some degree of confidence in their own judgment and incorruptibility. But the larger question is: How much trust should patients place in a doctor’s self-confidence? When doctors feel sure their decision-making is unaffected by who’s paying them, are they always right? While team physicians seldom attract media attention, Boston sports fans will remember the doctor who did step in. One day in 1993, Dr. Arnold Scheller, the physician for the Boston Celtics, got a phone call that left him heartsick. Reggie Lewis, a 27-year-old small forward, had collapsed at practice and soon died. Lewis suffered from a condition called ventricular tachycardia, or VT. That was the diagnosis Scheller and a group of experts, dubbed the “dream team of cardiology,” had made just a few months earlier after Lewis had collapsed during a playoff game against the Charlotte Hornets. Scheller had the full support of the coach, the owner, and legendary general manager Red Auerbach for his decision to pull Lewis off the court. The dream team decided that if Lewis had the necessary surgery and a pacemaker for the life-threatening arrhythmia it may be possible for him to return to play. Not treating VT, though, would be fatal. “The idea that team doctors have conflicts of interest is completely overblown,” says Scheller, who served as Celtics head team physician from 1986 to 2005 and still consults with Boston-based teams. “I was paid by the Celtics, but I still had to make the right decisions for the player. Reggie was one of those players, and the team supported my decision to take him out.” He adds that serving the athlete’s interests is what a physician’s oath demands. Still, Scheller’s bio suggests that he’s much tougher than the average person. A highly decorated military veteran, he served with elite units in Iraq, Afghanistan, and elsewhere. Confronting life-and-death decisions about a soldier’s combat-readiness takes expertise and grit. Scheller says more junior doctors would contact him for advice on how to deal with difficult coaches who disagreed with their medical decisions. He still receives these calls from time to time. Many academic researchers argue, however, that relying on the fortitude of individual team doctors leaves athletes with too little protection. Calandrillo, the law professor in Seattle, sounded an early alarm in a 2005 paper. The debate has only become more urgent amid mounting concerns about concussions, especially in football. For the last two years, an interdisciplinary team at Harvard University has been studying the health of professional football players. The team’s first major report came out last fall. It offered 10 major recommendations, of which the most pressing was to establish two sets of physicians for each team. The “players’ medical staff” would be chosen by a panel that included the NFL Players Association and the league’s health office, and would be responsible solely for monitoring athletes’ health. A second set of physicians, chosen by the team, would evaluate a player’s health for business purposes, such as contracts and trades, but play no role in providing care to that athlete. Law professor Glenn Cohen, one of the lead authors of the Harvard report, points out that bias and conflicts, by their inherent nature, are often difficult to perceive. The findings were controversial; the NFL offered a 33-page rebuttal a few days later. Cohen’s colleague on the Harvard study, neurologist Alvaro Pascual-Leone, argues for a system of unaffiliated neurotrauma consultants, or UNCs. Since 2013 the UNCs have been tasked with helping provide an objective clinical assessment of concussions during NFL games, and in the NHL since 2015. If there is a discrepancy between the UNC judgment and that of the team physician, the player is still taken out of the game. This protocol was followed with Sidney Crosby during the April game; the decision to return him to the rink for the remainder of playoffs was left to the head team physician. But just having a second opinion on or off the field isn’t enough. Collective bargaining agreements in the NFL, NBA, and NHL have entitled players to second opinions from physicians for years, and in most cases these leagues foot the bill. The catch is that the athlete has to ask — and sometimes fight — for it. Pascual-Leone argues that more stringent guidelines and checklists could also help with assessing fitness to play. Elsewhere in the medical world, mandatory pre-surgery safety checklists have reduced medical error and resulted in fewer complications. In other words, the simmering discussion about team doctors is one more front in a larger debate: Traditionalists defend physicians’ autonomy. Reformers argue that even well-trained professionals are fallible, and seek to protect patients through procedural checks. In the end, tinkering with where team doctors sit in the organizational chart won’t end this debate. We also need a clearer consensus about what we want out of the medical profession itself. Dr. Amitha Kalaichandran is a resident physician, a health journalist, and a 2017 fellow in global journalism with the Munk School of Global Affairs in Toronto. Follow her on Twitter @DrAmithaK.